Looking for Conservatory Blinds In York?, we’ve got you covered! With an outstanding selection of contemporary and minimalist blinds to choose from. 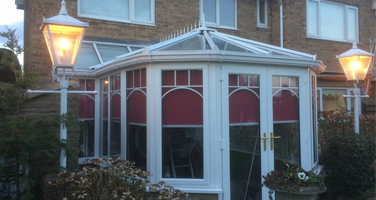 Conservatory blinds in York are an absolute must-have for any conservatory as they can provide additional protection against strong sunlight by blocking out sunlight or insulate your conservatory windows to ensure that your conservatory is liveable in, whatever the time of year is. A conservatory is a great addition to any home, providing extra room to accommodate any guests or extend your living space. However, when Summer arrives, and the sun decides to come out, you can really see the benefit of a conservatory, allowing you to effortlessly relax in the space, with large windows giving you a full view of your beautiful garden and surrounding environment. However, the disadvantage of this is that with the windows allowing in so much light, you can suddenly find that your conservatory can get quite warm. Conservatory Blinds in York help to deliver a cost-effective solution that goes further than simply light filtering, helping you to straightforwardly regulate the temperature by adjusting the blinds. In a conservatory, heat can be quickly intensified due to the significant amount of glass that is in a conservatory, meaning that any outdoor heat can be intensified, which can make a conservatory uncomfortable. We provide a variety of designs so that you can choose an appropriate solution to complement your conservatory’s design without needing to compromise on the effectiveness of your conservatory blinds. As sun can come in from any angle to your conservatory, using roof blinds can help to give you absolute control over light filtering and temperature regulation. 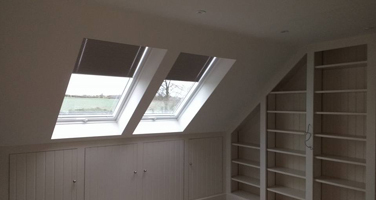 Subtly covering the roof, roof blinds can be ideal for a particularly warm summer day with a simple control mechanism that is as easy to use as conventional window blinds. Vertical blinds are made of slats that clip onto a sliding track which are connected by stabilsijng chains to allow you to easily control light intensity and temperature regulation. Vertical blinds can be safely installed for your conservatory blinds, helping to provide your conservatory with exceptional quality and value, whilst giving your conservatory a modern look. Our vertical blinds are available in a range of shades, from the crispest whites to calm creams, providing an understated yet sophisticated finishing touch to your home. A roller blind is a single piece of fabric that wraps around a casing, which can fit effortlessly into the top of your window frame. 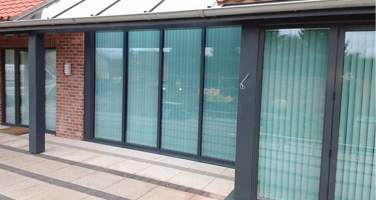 A roller blind can be easily operated by a pull cord that is attached to the bottom of the blind or by a sidewinding chain, allowing you to simply open and close your blinds remotely. With so many colours and styles to choose from, we’ve got you covered with a range of roller blinds suitable for any conservatory. At Blind Image York, we aspire to combine the best functionality with the most inspiring design with the most natural grains to the most modern textures available. For more information on conservatory blinds in York or any of our other products, please feel free to get in touch with our friendly team by calling us on 01904 862042. First class service from start to finish,excellent product,fast and efficient ordering and fitting 100% recommended,Thank you James and the team at Blind Image. A fantastic company to deal with both service and quality. I would highly recommend using this company. © Copyright 2019 - Blind Image York - All rights reserved.